Leeds United top scorer Chris Wood. Leeds United will be hoping their impressive home record can help them to still play a part in the race for an automatic promotion place in the remainder of this month. After a hectic recent spell there are just two games left in March and both are at home with the Whites looking for six points that can go a long way to sealing a top six place and keep them in the hunt for a top two spot. While United are still realistically outsiders for an automatic place there are a few signs that Brighton, currently in second, are not the certainties they appeared a month ago. Defeats to Newcastle and Nottingham Forest have encouraged the chasing pack, which includes Leeds, who are just two places behind them. There is a daunting nine-point gap between the teams, but the Seagulls have still to come to Leeds and after their recent setbacks they will not now be relishing their trip to Elland Road on Saturday week. Before then Leeds take on Queens Park Rangers this Saturday and will be out to make it eight clean sheets in 10 in home games. 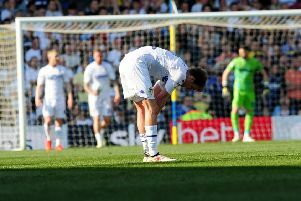 They have won 11 times at Elland Road this season, including eight victories from their last nine matches there in the EFL Championship and have been going a long way making it the fortress that Garry Monk said he wanted when he first came in as head coach last summer. This is in big contrast to last season when they only managed seven home wins in their 23 matches and lost eight times. For the first of the upcoming home games Leeds will be without midfielder Kalvin Phillips, who is due to be suspended for two matches after his sending off in the 1-1 draw at Fulham, with Monk choosing between Ronaldo Vieira and Eunan O’Kane as his replacement. He will check on top scorer Chris Wood, who missed the Fulham trip with a calf strain not thought to be serious while right-back Luke Ayling will be available again following the birth of his baby daughter and Monk has a tricky selection decision with Charlie Taylor fit again to play at left-back and Gaetano Berardi doing such a good job in his absence. On Wood’s injury, Monk said: “He just had a bit of tightness in the calf after the Birmingham game, so rather than risking him and taking a needless risk, I decided to rest him for this game, so it’s as simple as that. There’s no need to risk that situation. Despite conceding a last-gasp goal, Monk was pleased to come back with a point from the important game against a Fulham side just outside the play-off places. He added; “I guess it feels a little bit like a sucker punch because of the way their goal came right at the very end but that’s football. We have to take it on the chin and ultimately it’s a very good point against a very good side. “I thought we were excellent and I was really proud of that performance. I guess if anything we just needed that second goal. The chance where it hit the post would probably sealed the game for us.